The following are parts of the historic judgement delivered by the Supreme Court (SC) in the case of the “State of Madhya Pradesh vs Ramashankar Raghuvanshi” on February 21, 1983. The judgement was delivered by Justice Fazal Ali, who was believed to be a ‘card-carrying communist’. The recipient, a municipal school teacher, Ramashankar Raghuvanshi, had been dismissed by the Madhya Pradesh government in 1974 for having ‘taken part in RSS activities’ – after which he had appealed to the SC. My awakening from the classes at ISDM concerns the actions based on our ‘isms’ (which indicate the body of principles, practices and ideologies we believe in), in comparision to those based on values we are all born with as human beings (the universal values). I have understood why I shouldn’t take a stand based on my ideology or ‘isms’ – and instead base it on my values. In a way, instead of focussing on ‘what’ to achieve, I need to put my attention on ‘how’ to achieve. In our day-to-day lives, we all carry certain biases based on our ideologies – and our tendency is to simply go with that initial reasoning and start judging the ‘others’ or the ‘opposites’. In a way, this tendency makes us blind and stops us from listening to and understanding others. The stronger our conservative beliefs, the firmer our convictions – and this is precarious. We start thinking that the ‘others’ or the ‘opposites’ get what they deserve. 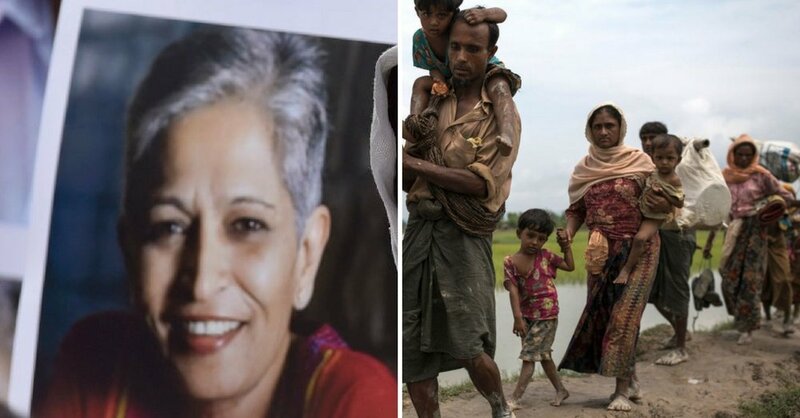 We all remember the shocking images of the drowned Syrian boy and those showing the tragic plight of the refugees, or the tragic news of the Rohingya refugees of Myanmar, or news of the assassination of senior journalist Gauri Lankesh – all of which spread on social media. Often, these convictions lead to large-scale devastation. In the late 19th and 20th centuries, we have seen devastation on mammoth scales, based on the maddening fights between ideologies to prove which one is a panacea! One ‘ism’ trying to prove its supremacy over others has often lead to holocausts, mass annihilation, world wars and religious, political, ethnic and cultural fanaticism. People round the world have been killed and displaced because of ‘ideological reasons’. That’s why we need to focus on universal values again. India, on the other hand, through her pillars of democracy and modernity, spoke of a different world view which supported peace and human values. In 1893, at Chicago, Swami Vivekananda proclaimed the message of universal tolerance and internationalism. In “The Story of My Experiments with Truth“, Gandhi pointed out that his path is based on two ideals – ahimsa (non-violence) and satyagraha (search for truth). He also stated that truth is not rigid, fixed or static – it is ever changing. Another pillar of modern India, Rabindranath Tagore, developed the concept of “Viswa Bharati”, which considers the whole universe as a teacher. None of them claimed any ‘ism’. Rather, they spoke of values like oneness, agency, dignity, freedom, equity and fraternity for oneself and others. Based on my reflections and learning in the past few weeks, I feel that the way forward for us as humanity has to be based on kindness, healing and making peace. I find affirmation in His Holiness the Dalai Lama’s message and words which convey the same thoughts for the world. This can only be achieved by embodying the values of the inner being and their appropriate manifestation in the outside world. Embodying the values is synonymous to feeling the greatness within oneself. Acceptance of the self is the foremost step towards being more accepting and spreading oneness in the world. We can then accept the same greatness within each human being and recognise that there is no difference between people. We are all made up of the same consciousness and our needs and values are completely similar. Until we do this, we won’t be able to empathise with the ‘other’ and connect with the ‘opposite’. Empathy is the key to the new world order. Through value-based learning, we can connect deeply to the needs and feelings of the other, empathise and have a dialogue. The future of the earth is critically clinging to this ability for dialogue and making way for peace and harmony, instead of separating and fighting.